Click on a vegetable to read each blogger’s post. Leading the MMGM parade today is COMPLETELY FULL BOOKSHELF. Here you can find reviews and recommendations on a wide variety of books. Dig a bit deeper and you’ll even discover poetry. Click on the tomato to reach today’s feature, a recommendation for the The Magic Cake Shop by Meika Hashimoto. And congrats on your two year blogging anniversary! This week at ALWAYS in the MIDDLE I have a review of THE GIRL WITH MORE THAN ONE HEART by Laura Geringer Bass. Author June McCrary Jacobs has a historical fiction feature on: ‘Strongheart: Wonder Dog of the Silver Screen’ written by Candace Fleming. She also has some ‘Fun Bonus Content’. Patricia Tilton at Children’s Books Heal reviews the culturally rich MG novel, Amal Unbound by Aisha Saeed. Kara Armstrong at Scribbles of an Aspiring Author features a review of The Assassin’s Blade, by Sarah J. Maas. Suzanne Warr at Tales From the Raven spotlights The Penderwicks at Last, by Jeanne Birdsall. BOOKS 4 LEARNING returns with a post on the historical fiction, STELLA by STARLIGHT by Sharon M. Draper. Author Rosi Hollinbeck has a REVIEW and GIVEAWAY of Al Capone Throws Me A Curve by Gennifer Choldenko. 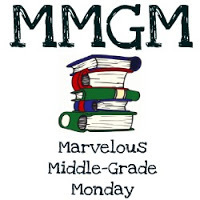 Karen Yingling at Ms. Yingling Reads always has an interesting MMGM post. Be sure to check out today’s feature and all of her reviews the past week. Love the produce icons! Now, if I could just keep the squirrels from eating my tomatoes! Hope you are doing well getting ready to go back to school.